Business owners today are well aware of the importance of online presence and reputation review management. With 90% of consumers reading online reviews before visiting a business, its vital that you not only monitor, but also engage, be active on social & make sure your business information is 100% accurate. Take back control of your online brand across 60+ digital services & citations, synchronize your Businesses info, rank higher and be easily found across the web no matter what platform or device your customers use, thus enhancing your SEO and search results. Make maintaining an online presence and interacting with your customers simple and effective. Consolidate reviews from multiple platforms to one single timeline. 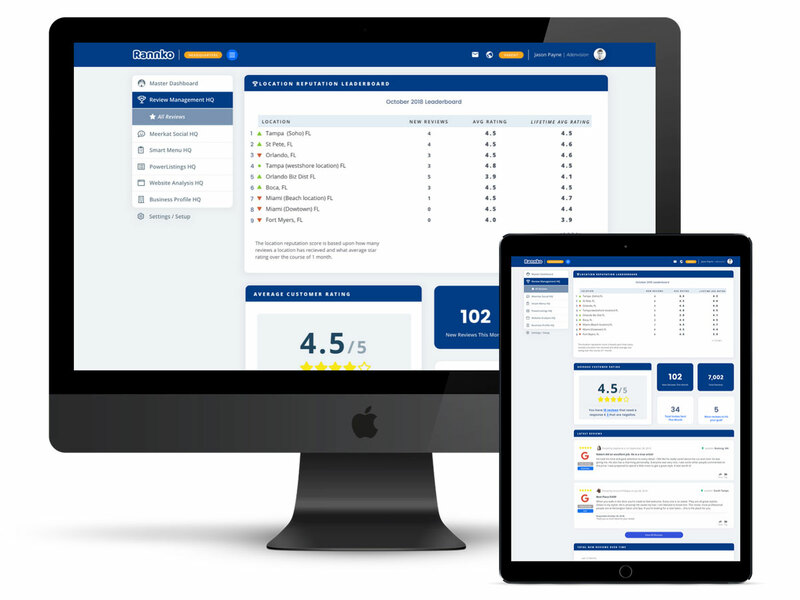 Our review management system makes achieving 5 star customer satisfaction as easy as a click of the mouse. Interacting across all of your social networks has never been easier! Create a customized weekly scheduling queue for scheduling posts. Share industry related curated content from 1 of our millions of article and get a consolidated look at timeline and brand assets. Rannko is a 5 ⭐️⭐️⭐️⭐️⭐️ user-friendly platform that is at the forefront of digital reputation management, helping business owners large and small grow their brand and improve public perception. Turning your customers into your very own brand ambassadors. For multi location businesses and franchises. Have ultimate control from the single location to the multi location manager. Use Master Dashboard to leverage the power of Reviews, Social Media & Powerlistings. See the reviews from all of your locations, served into a single dashboard. Know which locations are under performing and listen to your customers at a high level. Multi location review management PDF reporting available. Post to multiple social platforms for the ultimate control across 100’s of facebook pages. Override the scheduled queue and regain authoritative oversight on social media. Are your locations synced across the network? Make sure your verbiage, business data and messaging is 100% accurate. Once you set up multi location Powerlistings, sit back and watch the results pour in.